Agartala, the state capital of Tripura, is set amidst vast expanses of tranqui9l beauty making it an ideal base for exploring the ancient palaces, temples, lakes and wildlife sanctuaries of this erstwhile princely state. But take time off to explore the city’s own charms. Sitting astride great Mughal-inspired gardens., with a pool and gurgling fountains, the Ujjayanta Palace was built by Maharaja Radha Kishore Manikya Bahadur in 1901. Located in the heart of town, its interiors are embellished with magnificent tiled floors, delightfully curved wooden ceiling and beautifully crafted doors, Floodlighting, a recently introduced feature m, makes it an eye-catching landmark at night. from Kolkata to Agartala daily. Rail:The nearest railhead is Kumarghat, 140 km away from Agartala. 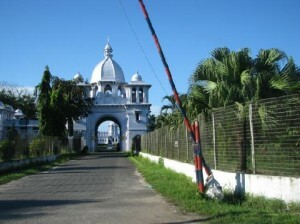 Road: Guwahati is at a distance of 600 km from Agartala. It can be covered by daily Bus services in 24 kms. Unmetered Taxis, Auto rickshaws and City Bus services are available from Agartala Airport. Kunjaban Palace: A picturesque hillock which Maharaja Birendra Kishore Manikya Bahadur constructed as his country palace for private retreat, now serves as the Raj Bhavan, official residence of the Tripura Governor, Tagore stayed there in his seventh and last visit to the state. Government Museum: A small museum where sculptures are displayed as imaginatively as if they were in an art gallery. On display are some rare stone images, old coins, Bengal Kantha and archaeological findings from Tripura and adjoining areas. Also interesting are the life size portraits of the former rulers of Tripura. Closed on Sundays and Government holidays. Sipahijala Wildlife Sanctuary:Sipahijala Wildlife Sanctuary is located 25 km from Agartala. The vast colony of residential and migratory birds makes Sipahijala Wildlife Sanctuary a lively attraction for birdwatchers. Just 30 km away from Agartala, it covers an area of 18.53 sq. km. Kamalasagar: Maharaja Kalayan Manikya initiated the excavations of Lake Kamalasagar, 27km from Agartala. There’s a popular 16” century Kali Temple on the edge of the lake, Steps have been taken to encourage rural tourism around the temple region. Pilgrims from around the country and nearby Bangladesh converge annually at the temple in the months of April and August to celebrate the temple deity Goddess Kali. Its tranquil, pollution-free environs and natural setting make Kamalasagar an ideal holiday escape for tourists. Kamalasagar Kali Temple: Kamalasagar Kali Temple is located 30 km from Agartala. Maharaja Dhanya Manikya built Kamalasagar Kali Temple, on a hilltop in the late 15th centuries. It is situated just beside the Bangladesh border. The lake in front of this temple rightly enhances its beauty. Tripura Sundari Temple: Tripura Sundari Temple, which is at a disance of about 55 km from Agartala, is located on a hilltop at Udaipur. It is regarded as one of the 51 Pithas of Hindu pilgrims. It consists of a square type sanctum of the typical Bengali hut type and was constructed by Maharaja Dhanya Manikya in 1501 A.D. The lake in front of the temple has added to its beauty. Thousands of devotees visit this temple round the year, particularly during Dewali festival. The District town, Udaipur is also called as Temple City and Lake City. Bhubaneswari Temple: Bhubaneswari Temple is located 55 km from Agartala. Udaipur, situated on the banks of the River Gomti, is a city of lakes and palaces; the remains of a dilapidated palace on the northern banks of the river are a reminder that his small town was once the seat of the Manikya dynasty rulers. Mahamuni: Famous for its ancient Buddhist temple, Mahamuni lies 150 km from Agartala. The temple draws Buddhists pilgrims from as far off as Thailand, Myanmar and Sri Lanka apart from those nearer home from Bangladesh. This entry was posted in Agartala, Tripura. Bookmark the permalink.